Shark Conspiracies: Are Experts Knowingly Misleading The Public About 'Accidental' Shark Attacks? Shark Conspiracies: Misclassification Of Shark Attacks Continues; What's Next? 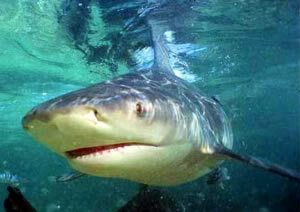 A bull shark. These large and aggressive sharks are suspected in a rash of gruesome attacks recently off a Mexican beach near Acupulco. The latest episode takes the listener from Florida to Fiji, to North Carolina and Mexico, and from the beaches of Brazil to a coroner’s table in San Diego, with a particular theme in the backdrop throughout: Examining the reporting practices and tactics of the International Shark Attack File. The episode also features a gripping interview with surfer Mark Healey, who describes his encounters with Hawaiian tiger sharks in thorough and haunting detail. The 19 minute podcast is available to listen or to download for free at www.sharkconspiracies.net. Thanks again Kevin for your continued work on these controversial issues . BOTTOM LINE--HUMANS ARE IN DANGER AND MUST BE PROTECTED ASAP--THIS MEANS WE MUST PUSH HARD FOR SECURE, WELL MAINTAINED NETS ON OUR BEACHES. THE BEST ONES TO EMULATE ARE IN THE HONG KONG AREA BEACHES WHERE THEY HAVE NOT HAD ONE FATALITY SINCE THE NETS WENT UP IN 1995. ASK YOURSELF ONE QUESTION--WHY HAVE NETS NEVER BEEN INSTALEED IN AMERICA TO PROTECT OUR CITIZENS? WE ARE IN CONTROL OF OUR WORLD NOT THE ANIMALS AND SCIENTISTS WHO NEVER GO IN THE WATER!!! 76 PER CENT OF ALL ATTACKS ARE MADE AGAINST SURFERS!! RICHARD FAWELL A SURFER WITH 2 SONS WHO SURF! Richard fawell, how about you and your boys stay out of the water. solves your problem.